The range of color in roses is so great and so harmonious that one can hardly make a mistake. We cannot have too many roses, and there is no position where they are out of place. Walls and fences deserve their share; house walls are never as beautiful as when clothed with healthy and prolific rose climbers. In the shrubbery, rose bushes help to redeem the masses of monotonous green foliage. On the lawn, as standards or pillars, rose bushes add a welcome note of color; and in beds and borders they contribute their quota to the general effect. Even as hedges, roses have their use, and for arches and pergolas there are no more charming climbers than roses. Pegged down, or trained over an ironwork dome, they make glorious bushes of flower and foliage. A sunny site should be selected for the rose garden and the best rose garden design is to lay it out formally by designing it on a symmetrical basis. The most common method is to cut the rose beds in grass; the beds should not be elaborate in outline or too small. The groups of rose bushes should show a geometrical relation between their component beds as seen in the plans illustrated below. 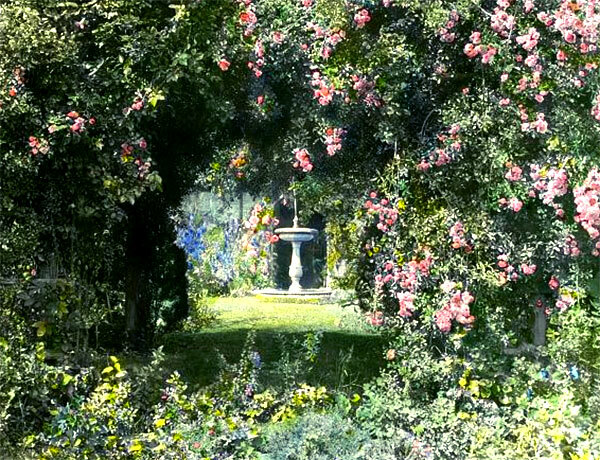 The rose garden can take a shape having equal dimensions both ways or it may be long and narrow. A narrow rose garden design is the best form when space is restricted; it can be better brought into harmony with the adjacent parts of the garden. The first of our rose garden designs shown below features a traditional rose garden layout that could be used on a grass space with the outlying borders providing a sense of enclosure and sanctity to the whole arrangement. This could also be enhanced by planting the outer lines with standards or pillars, as is shown in the plan to the right. Also shown below is the introduction of arches at suitable points -- an excellent device for obtaining height. 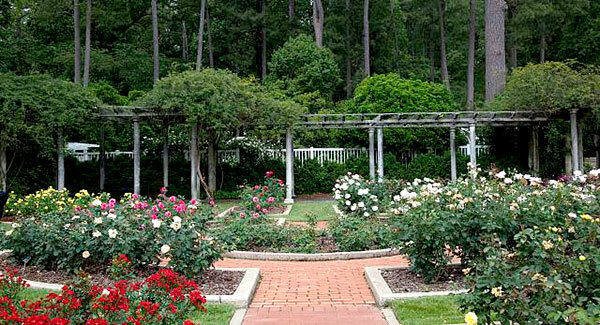 The necessary shelter in exposed garden settings can be arranged by the use of rose or sweetbrier hedges, or of roses trained upon a skeleton fence. 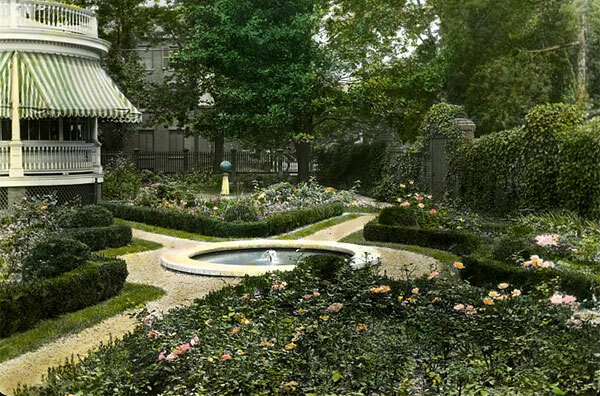 It is not unusual to carry a path through the rose garden, or to set it where two paths intersect at right angles. The point of intersection is sometimes marked by a sundial or vase. Alternatively, when a path or paths lead into the rose garden, the beds may be separated by gravel, thereby excluding grass altogether. Such rose garden designs are shown in the illustration below. These rose beds can be made elegant and sculptured by the use of neatly clipped box edgings. One loses, however, the delightful background a grassy emerald turf supplies. The design for the layout of the plants or rose bushes in a rose garden is largely a matter of taste. With many beds to fill, we may devote each bed to several roses of the same color or kind, and thus get a color effect in masses. On the other hand, with a less elaborate garden, contrasting or harmonizing colors may be associated together in the same bed or border. The range of color in roses is so great and so harmonious that one can hardly make a mistake, except perhaps in associating the magenta tinted varieties with reds and pinks of purer hue.